Are you tired of late-night trips to the store for more papers, or must-have cookies and chips? If so, have no fear because goPuff is here. Are you tired of late-night trips to the store for more papers, or must-have cookies and chips? If so, have no fear because goPuff is here. Not only are they open late, but they also deliver right to your door. From ice cream to rolling papers, you name it, and they’ll bring it in 30 minutes or less. Brace yourself for a service that brings just about anything directly to your door. Not only is goPuff convenience on wheels, but they also are up late and offer fast and sometimes even free shipping. The 24-hour online delivery service, in particular, was thought of by two former Drexel University students. 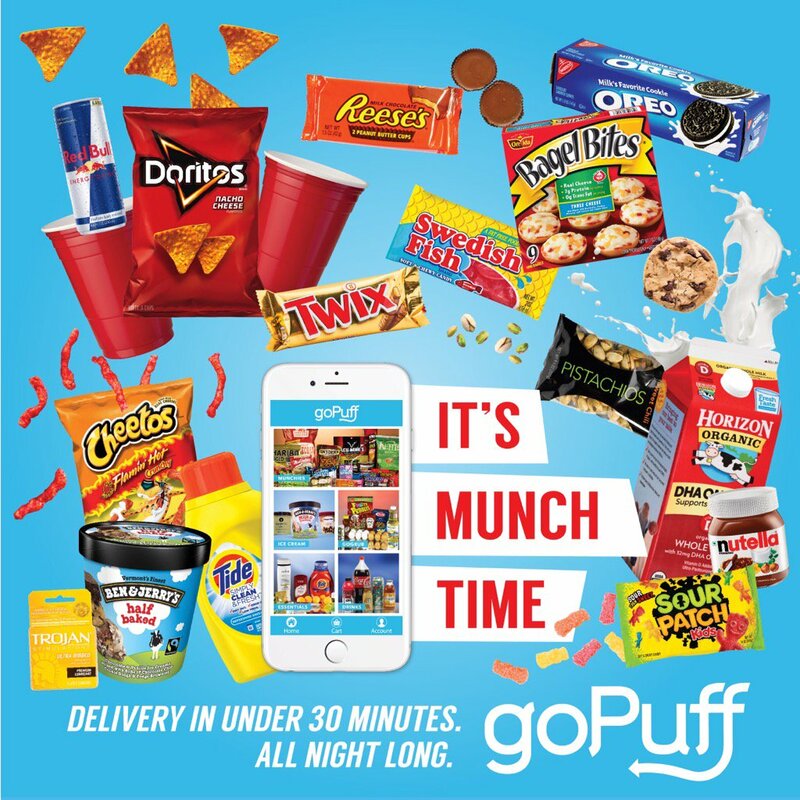 Although the business began with making deliveries in between classes, goPuff is now up and running in twelve U.S. cities. The Center City-based service, which runs on both Apple and Android apps, is currently planning on expanding their service even further in 2017 thanks to a $5 million infusion from its primary investor, Anthos Capital, which also initially invested $3.25 million to help get goPuff going. The cities they have their eye on, in particular, include Columbus, Ohio, Nashville, Tennessee, and Minneapolis. We never expected to grow exponentially like this. We knew when launching it, it might be a hit, or it might not. But those that tried it really fell in love with it. The retention is super high. We can be at [a customer’s] door in 20 minutes, so they don’t have to get distracted at work, or while they’re studying, to go to the convenience store. The ethos behind goPuff is that they can deliver whatever you want, whenever you want. Whether it be chips, batteries, rolling papers, and even beer. In fact, there are two subsidiaries for alcohol – goBeer and goBooze. The service operates from noon to 4:30 a.m. in most markets. Moreover, it charges a small $1.95 delivery fee, which is waived for orders over $49, with zero surcharges. People have been calling to franchise us out in Colorado. Formula 420 wants to franchise our business out there, but I’m not ready for the marijuana thing and that’s not how we want to grow. With cannabis now being legal in several states, goPuff may eventually be ready to hop on board the cannabis train. Until then, you can at least enjoy having late-night munchies and rolling papers delivered to you.